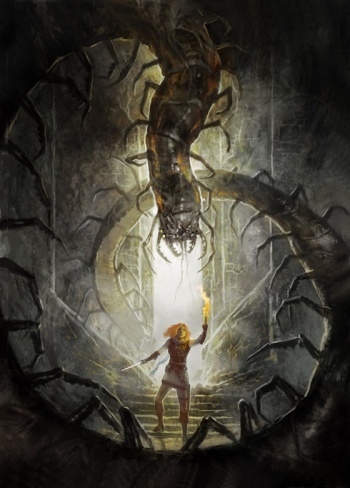 Medieval horror tabletop RPG Shadows of Esteren is currently in the midst of its fourth Kickstarter campaign to fund a new supplement. With over $250,000 raised across its previous three campaigns and its fourth already bringing in another $100,000, Shadows of Esteren is a prime example of how Kickstarter is revolutionizing the tabletop publishing industry. But for some of you, this may beg the question - why do the creators of Shadows of Esteren keep returning to Kickstarter? Shouldn't they be able to keep publishing based off sales proceeds? Speaking with The Escapist, Shadows of Esteren line director Nel addressed the concern. "That's a very good question," admits Nel. "Why a fourth campaign? One's first - and legitimate - reaction might be to say: 'Come on, they're pushing it. They're just being greedy!' However, there are very good reasons for this choice." The team made its intentions clear from the beginning with its first Kickstarter campaign, Nel explained: All Shadows of Esteren books would be made available through Kickstarter in order to allow backers to easily follow the series and have access to new material. With the game's small development team based in France, international shipping poses a logistical hurdle - one that Kickstarter helps them overcome. "It is a cost-effective medium," said Nel, "particularly with regards to shipping fees: Players from everywhere in the world can get advantageous shipping fees, whose cost is absorbed by the overall earnings. It's a beautiful collaboration." $250,000 in funding - plus sales - should be enough for the Esteren team to continue without Kickstarter. Nel doesn't deny this. 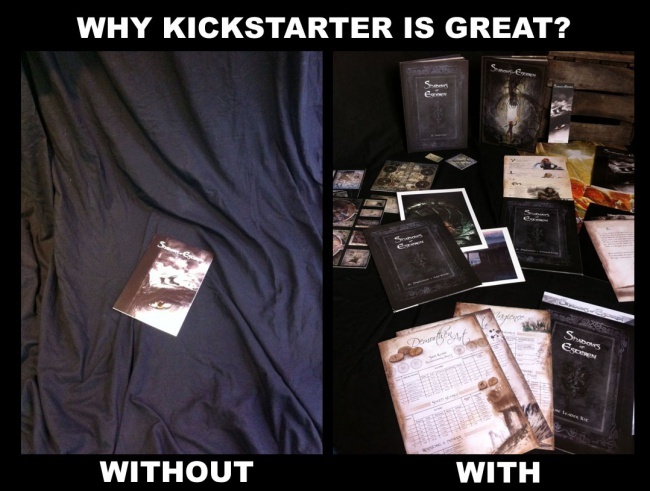 "Obviously, we could publish Esteren without making use of Kickstarter," he said. "It's what we have done in France, after all." "Needless to say, the American version would be simply and completely out of reach for a regular editor," says Nel. "This is the strength of Kickstarter: the creators can make their dreams come true and the backers can get special content at a great quality-price ratio. This is mainly possible thanks to the Stretch Goals, thresholds that are reached as the total amount grows." Kickstarter's stated mission is "to help bring creative projects to life," and while Esteren would not have died without Kickstarter, it probably wouldn't have been able to match the quality standards of big publishers. In the end, both the publisher and consumer come out winning, because the consumer gets a superior product to what the publisher would have otherwise been able to provide with a bootstrap budget. "The more the project is financed, the more everyone benefits from it," said Nel. Does this mean that the way Kickstarter is used has changed since its inception? Nel believes so. "Kickstarter sparked something of a revolution," he says. "I don't think that its creators anticipated what it would result in. Indeed, in the beginning, it was certainly meant to help kick off innovating projects. However, it goes further than that: it directly changes the relation between the creator of a product and its consumer. It creates a closer connection as the consumer becomes an agent who is directly involved." After all, it is the backers who decide where to invest their money. Some believe in the product enough to invest hundreds of dollars. Nel makes the analogy of patrons of the arts in the Middle Ages, who were featured in the artists' works. Similarly, Esteren's big backers are featured as characters in the game. "Kickstarter is the return of patronage!" said Nel. "That is how Kickstarter goes beyond kick-starting projects: it is a veritable revolution in the relationship between creators of content and their audience." Esteren's fourth Kickstarter will be coming to a close soon, but it reached 100% funding within a couple days of launching. "It's a bit crazy, really," Nel says about the unexpected level of success that his team's Kickstarters have accrued. "But at the same time, it gives us wings." 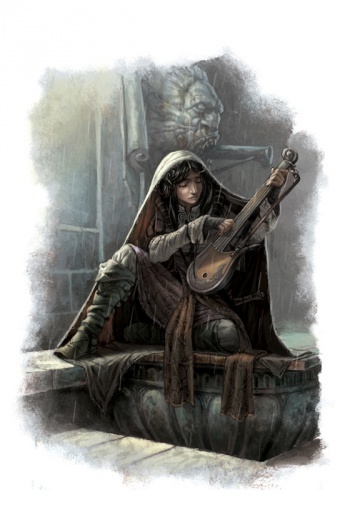 Shadows of Esteren is the product of RPG enthusiasts. Nel has been writing scenarios ever since he first started playing Dungeons & Dragons as a teenager, and what began as a passion project among friends grew into a game that went on to win three ENnie Awards in 2013. "Of course, you always hope that your work is going to get a good reception, particularly when it's work you love," said Nel. "In our case, no one could have predicted what happened next. This year will mark our third attendance at Gen Con, and for me, it's a kid's dream come true. We are backed by a wonderful community whose members, whether they are from France or from anywhere else in the world, are amazingly generous." The team doesn't take its community for granted - instead, it is an impetus to keep producing quality products. "Having such a supportive community is also a big responsibility," Nel said. "They trust us, and we must not disappoint them." There is no magic recipe for Esteren's success, Nel explained, only a lot of hard work. "Although success is a very positive thing, it must not make us complacent with our work." The Kickstarter campaign for Shadows of Esteren's latest supplement, The Monastery of Tuath, ends April 6.